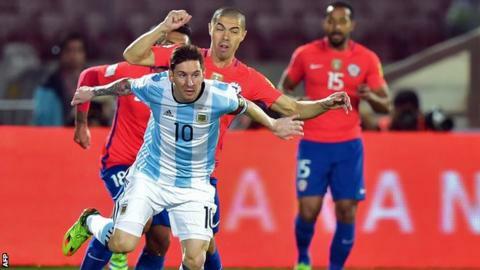 Lionel Messi inspired Argentina to a 2-1 win over Chile in South American qualifying for the 2018 World Cup. The Barcelona forward, who missed the first four games of the campaign with a knee injury, laid on the 24th-minute winner for defender Gabriel Mercado. Felipe Gutierrez had put Chile ahead before Paris St-Germain winger Angel Di Maria equalised in Santiago. Argentina, beaten finalists in 2014, are fourth in the 10-team group with the top four qualifying automatically. Second-placed Uruguay play Brazil, who are fifth, in Recife on Friday, in Luis Suarez's first competitive international since biting Giorgio Chiellini at the 2014 World Cup.